Cruel, barbaric, inhumane, ridiculous. That is what we think of pig wrestling, Wisconsin’s choice of entertainment at several local fairs this summer. Just look at the face of the pig being treated with pure disrespect by the three contestants in the picture. We at Alliance For Animals and the Environment have attended such an event to see first-hand how the pigs are treated. We found the cheers from those in attendance – adults and children – were almost as disturbing as the act of pig wrestling. Please do not attend these events. This is pure animal abuse. Visit our website at nopigwrestling.org to learn more. Please speak up against form of bullying by writing a letter to the Portage Daily Register. Or comment online from the link below. Catch-a-Pig Contest : Portage Daily Register. Way to go Global Conservation Group! An animal rights group that sees pig wrestling as inhumane is urging people to boycott the event at the annual Stoughton Junior Fair later this week. But a representative of the committee that organizes the fair disputes the claim that pig wrestling is cruel. An organization called Global Conservation Group sees the event in a different light. Pig wrestling, or “wrasslin,” is an event where contestants chase pigs around a fenced-off mud pit to attempt to place the pig on a barrel in a limited period of time, either 30 or 45 seconds, Wethal explained. Wethal explained that the event has been held at the fair for only the past four or five years. He said it’s done to attract more people to the fair. “We have to remember that just as humans, pigs also have the same ability to feel pain, emotions, and the desire to live,” the group wrote in its news release. The group also alleges that conducting pig wrestling or even viewing the event is illegal under Wisconsin law. “Spectators could be subject to prosecution for a misdemeanor offense for attending a pig wrestling event under section 951.18(2) of the Wisconsin Statutes,” the group claims. Wethal said the Fair Board did receive some complaints about the event a few years ago. He said the committee discussed and decided to continue it. Animal rights group urges residents to boycott Stoughton Fair | Connect Stoughton. The Global Conservation Group has joined Alliance for Animals and the Environment in a campaign against Wisconsin Pig Wrestling! Pigs being punched in the face, kicked, body-slammed, jumped on, yelled at and thrown into a bucket – this is a typical pig wrestling contest in Wisconsin. 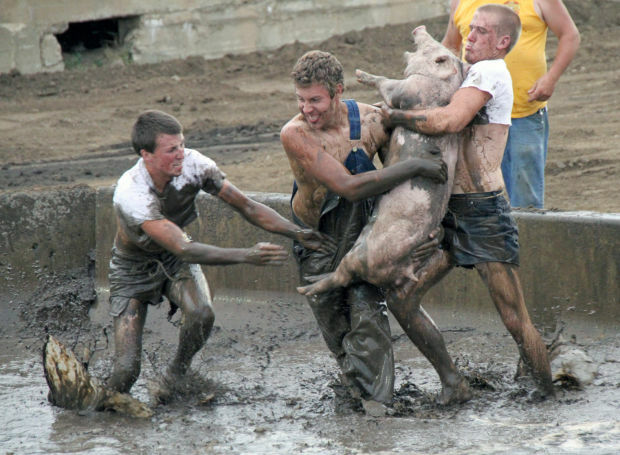 Pig wrestling, or “wrasslin”, is an event where contestants get to chase pigs around a fenced-off mud pit to attempt to place the pig in a barrel. Using pigs in this form of entertainment is inhumane! We have to remember that just as humans; pigs also have the same ability to feel pain, emotions, and the desire to live. The Global Conservation Group’s Legal Division will not only be contacting the district attorneys to prosecute those participating, but also everybody watching! Under Wisconsin Law, if you paid admission to an animal fighting event, you could be held criminally liable for attending. Spectators could be subject to prosecution for a misdemeanor offense for attending a pig wrestling event under section 951.18(2) of the Wisconsin Statutes. GCG Lays Hammer on Pig Wrestling – Milwaukee Animal Advocacy | Examiner.com.